The Seismological Society of America invites members of the public to a town hall meeting on earthquake early warning systems in the Pacific Northwest, including how they function, how they can prevent damage and injury and when they plan on being implemented throughout the region. The town hall will help kick-off a three-day international technical conference on earthquake science. A panel of EEW experts will speak at the meeting. Sandi Doughton, Seattle Times science reporter and author of Full-Rip 9.0: The Next Big Earthquake in the Pacific Northwest, will simulate a large earthquake and explain why the Pacific Northwest needs an EEW system. Scott Miles, an expert in disaster risk reduction in the Department of Human Centered Design and Engineering at the University of Washington, will speak about what he learned from his experiences in Mexico, where EEW has been in use for years. Michele Campbell, ShakeAlert program manager at RH2 Engineering, shares what this local engineering firm and its clients are doing to use ShakeAlert capabilities to make our infrastructure more resilient when earthquakes occur. 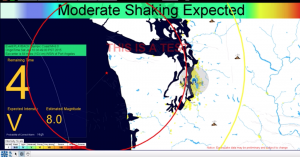 Harold Tobin, director of the Pacific Northwest Seismic Network (PNSN) at the University of Washington and a leader in the West Coast ShakeAlert EEW system explains how it works and when it will be operational. Doug Toomey, co-director of the PNSN at the University of Oregon, will hold a Q&A session for members of the public to ask questions and share their views.